The one-millionth Mazda MX-5 rolled off the assembly line in Hiroshima on the 22nd April 2016 sporting the color, and that means there’s enough Miatas out there by now for generations to come. I wouldn’t spend my money on a new car, but if I had enough cash in the bank, I would still buy a new ND Miata in a heartbeat. That’s how good it is, even when it has the smaller 1.5-liter engine available in Europe and other markets. 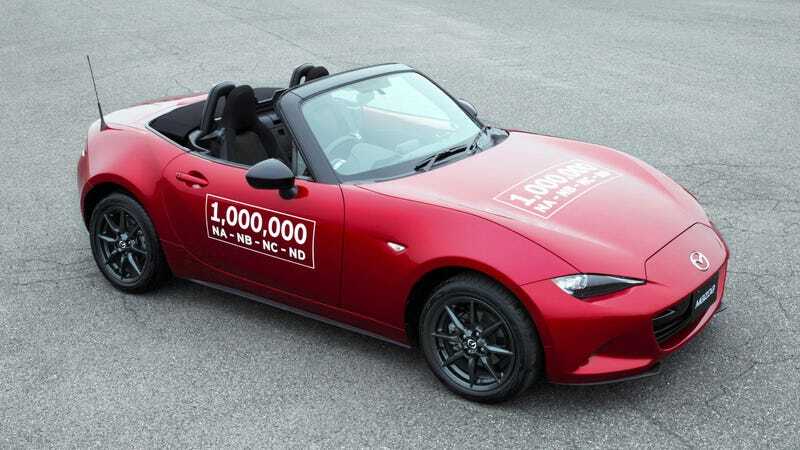 Now, you can also go all in an get a 2.0 RF with a funky targa hardtop, but either way, pop that champagne, because the one-millionth MX-5 rolled off the line thanks to Mazda’s team satisfying all those orders at Ujina Plant No.1 in Hiroshima. Mazda will celebrate this milestone at the Goodwood Festival of Speed, where both the 1M Miata and their fantastic MX-5 Spyder and Speedster concepts from SEMA will make runs up the hill. We wish Mazda better luck than last year. Please continue to flood the used car market with thousands of NDs, I’d like to pick one up eventually.